Happy Monday, everyone! I haven't participated in this meme for quite a while and I thought it was time to dip my toes in once again. Another thing I hadn't done in a while? READ A BOOK. But (crossing my fingers) I think the slump might be over (knocking on wood). 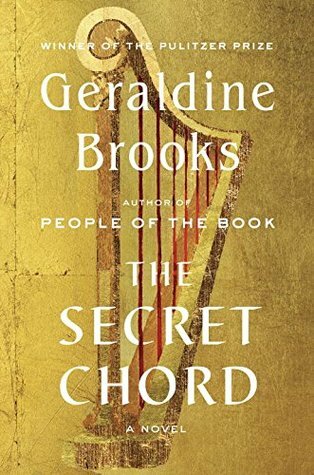 I'm currently reading The Secret Chord by Geraldine Brooks. I had the ARC, we're selling it at the bookstore, and I heard the author on NPR. It was a perfect storm that led me to grab this off the shelf. It's lovely, musical, lush, and I'm enjoying it immensely. What are you reading? I want to know! hi! Double take... "Relentless Reader posted!!!" (said out loud) I am going through a bit of a slump but am reading Free Men about the 1960s integration of UNC/Chapel Hill and a fiction The Snow Child but it is COLD and I don't want to read books set in very cold places right now. I just got the classics spin result that says I get to read From the Files of Basil E Frankensomething so I'm rather excited about that but I need to get my hands on the book. Ooooh, I really liked The Snow Child. It seemed like a fairy tale, or maybe a fable? I don't know, words escape me ;) But I really liked it a lot! I've seen some chatter about the #Emma200th, what a great idea! I haven't read that one in so long. I have Brown Girl Dreaming sitting on my shelf and have been meaning to get to it...I'm sure you know how that goes, lol. Thanks for stopping by! I was good to see you linking up this week - as someone else mentioned, I did a double take!! Great to see you getting back in there and hopefully over the slump - reading slumps are the worst! I'm currently reading Miss Peregrine's Home for Peculiar Children (reread) in order to finish the rest of the series which I picked up from my library a week or so ago. Thanks so much, Jade! :D Slumps ARE the worst, especially when they last for so long, yuck. That Brooks book is on my wish list for next year...hopefully I'll get to it. Right now I'm reading The Tears Of Dark Water by Corban Addison. I'm certainly enjoying it and I bet you will too, Teresa! Hallelujah, you and me both! Lol :D Happy reading to you as well, Kathy! Oh I've been in such a funk, slump, whatever it's called!! I haven't read Geraldine Brooks....but I'm hoping it's something you'll sink your teeth into. I'm reading Coal River by Ellen Marie Wiseman, it's very good. Also the latest Lisa Scottoline. What has happened in blog-land? Was there some anti-reading blogging virus? Good grief, I hope it's gone! I'm really digging this Brooks but I really loved Year of Wonders. If you ever run out of things to read (ha ha) you should look that one up! Sounds like you just had to read the book when you had all that going for it. Love to hear authors speak about their books. You are exactly right, I was compelled! I like hearing authors as well and I don't get too often enough. I like your header. I haven't heard an author speak in person before but I can understand the excitement and fun as I'm sure it's like me having met favorite knitting designers in person. Thanks, Stefanie :D I live in a very small area and it's VERY rare to hear an author speak. In fact, I didn't hear Brooks in person, just on NPR ;) But still, I enjoyed her talk and it definitely led me to pick up this book. Welcome back! I hope this one pulls you out of your slump! I've heard good things about it! Ummm there's a harp on the front. ;) Yep! Ha! I thought of you constantly while I was reading it! Love the sea gif!! Though I do not stuff my feet in the sea any more just the look of it makes me relaxed. I have made a start with The Portable Veblen which is having a lot of squirrels in the story. I am not sure my brain will register how the rest of the book is due to them. Hope you will slowly recover from the reading slump! I have this book too...ENJOY!! Hooray hooray for slumps being over! I keep my fingers very crossed that the slump is done! On Monday I was reading this one South Korean novel that was autobiographical as all hell and it was pretty dark but also pretty good, and I was also reading some Star Wars comics and a book about queer girls in Biafran-War-era Nigeria. Good stuff! Ooo...how was the NPR interview? What did Brooks talk about? She talked about the research she did, why she wanted to write about David (it had to do with her son taking up the harp), and why she used different versions of the character's name. It was super interesting! Glad to see yo were able to get into a book. It was great to see your post. I just finished The Lake House by Kate Morton-I was not a fan, although I've liked her other books. If you haven't read Playing With Fire by Tess Gerritsen I highly recommend it. Looking forward to more posts in the future. Hi Katherine, thanks! I've seen The Lake House around here and there but haven't really heard much about it. Now I know why ;) Thanks so much for coming by! I think Geraldine Brooks is a great way to dip back into the reading world. I hope you enjoyed it!